Monte De Oro, Southern California's Premier Wine Destination is one of Temecula Valley’s newest Wineries with a passion for growing quality estate grapes, handcrafting premier wines and providing an experience for its guests that is unparalleled in the Temecula Valley. Monte De Oro's 100% estate grown, award winning wines start in the Winery's 72 vineyard acres. Great care is taken to cultivate quality grapes from the time they bud in the spring to the time they are harvested in the fall. Annual grape production is between 125 and 180 tons generating between 8,000 and 11,000 cases of wine. One of Monte De Oro Winery’s main attractions is its 2,500 square feet Main Tasting Room space complete with cathedral ceilings, two tasting bars, six alabaster chandeliers and a glass floor that gives its guests a sneak-peak of the Winery’s Barrel Cellar. Another of Monte De Oro’s assets is the breathtaking 180 degree panoramic view of the surrounding Wine Country from their expansive outdoor patio, Monte De Oro continues to awe and inspire all that visit, sit and sip in the Temecula Valley. In addition to a line-up of tremendous wines, Monte De Oro has recently expanded their Wine Experience to include food offerings as well. Paring Monte De Oro's stellar line-up of wines, which include a full slate of food-friendly varietals, with Californian Contemporary Cuisine MDO Wine Bar & Bistro takes the Temecula Valley Wine and Dine Experience to a level yet to be achieved in the Valley. Address: 35820 Rancho California Rd. 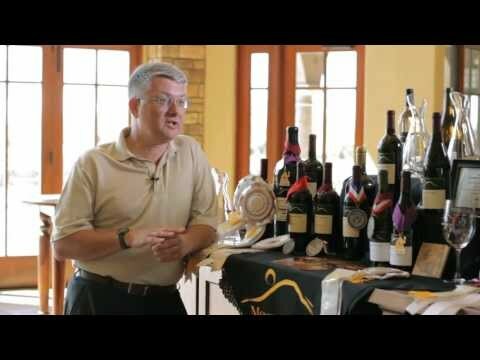 Winemaker: Ken Zignorski/Tim Kramer -Temecula Valley Wine Mgmt. Amenities: Barrel Room Tours, Private Tastings, Weddings, Corporate Meetings, Live Entertainment, etc.